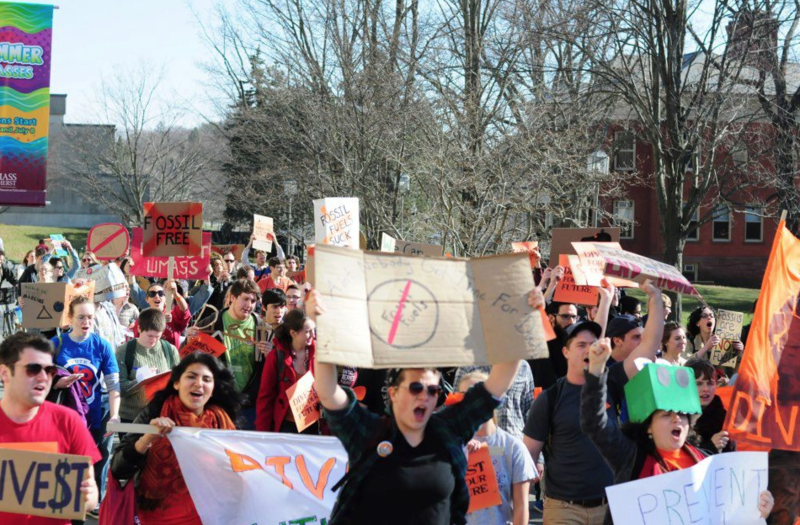 Last year, the University of Massachusetts Foundation, Inc., the nonprofit that manages the university’s $770 million endowment, dropped its stocks in big coal, but student activists are now demanding divestment from all fossil fuels. On Tuesday, fifteen students were arrested after they refused to end a sit-in at a UMass Amherst administration building. In a statement, UMass President Marty Meehan said he broadly shares the goals that student activists have been advocating for. “Throughout my career, I have stood for environmental progress and reducing the carbon footprint,” said Meehan, a former congressman. Skeptics, though, argue that divestment from fossil fuels is only a symbolic move that would accomplish little. “We need to focus on actions that are going to make a real difference as opposed to actions that may feel good or look good but have little real-world impact,” said Robert Stavins, director of Harvard’s Environmental Economics Program. So far, only a handful of schools, including Hampshire College and Syracuse, have pledged to fully divest from fossil fuels. Yale announced yesterday that it would partially divest. UPDATE Wednesday, April 15 9:52: On Wednesday night, 19 more student protesters were arrested. Members of the group Divest UMass say their demands were not met after administrators pledged to support a plan to divest from fossil fuels.